Learn about clean air in your home. For those who are ready to clear the air and take their indoor air quality more seriously, congratulations! Finding the right purifier can go a long way toward increasing respiratory wellness. Unbeknownst to many, our homes are filled with dust mites, molds, allergies, VOCs and more. Actively removing these indoor air pollutants can help stave off allergy and asthma triggers. Make sure your air purifiers don’t produce ozone. Ozone is a toxic gas that can have a detrimental effect on your respiratory health. Let’s dive into the benefits of whole home air purifiers vs. room air purifiers and identify reasons to utilize both. As the name implies, whole home air purifiers help clear the air in entire homes, rather than just one or two rooms. These systems cast a wider net that can filter out indoor air pollution and help your family avoid respiratory irritants. Additionally, since they cover more ground, these air purifiers are usually more cost effective than purchasing multiple room units. Whole home air purifiers can also extend the life of your HVAC system by reducing the amount of dust moving through the system. A cleaner HVAC system offers greater long-term efficiency, so be sure to maintain its upkeep throughout the year. These air purifiers are also, typically, hidden within your HVAC system and make little noise. They can even be programmed through your home’s thermostat, making it nearly a set and forget solution to breathing easy at home. Obviously, opposite from whole home air purifiers, room air purifiers clear the air in one or two rooms, rather than entire homes. Just like whole home air purifiers though, room air purifiers are typically programmable and can filter out indoor air pollution, helping your family avoid asthma, allergy and respiratory irritants. If you live in a small space like a dorm room or an apartment – or if your home simply doesn’t have whole home air purification – consider a room air purifier to supply supplemental bursts of fresh air throughout your home. When looking for a room air purifier, you’ll still want to look at the square footage offered to maximize your purification efforts. Room air purifiers are also extremely portable, which is great. This allows you to use them where and when you need them most – say, allergy season – and then stow them away when they’re not needed any longer. For some homes, you may find that you want to use them year-round in different scenarios…even if you already have a whole home air purifier. For those with whole home purifiers, you likely think you’re good to go with your current setup and therefore won’t need an air purifier. Whether you have a whole home air purifier installed or not, it’s never a bad idea to have a room purifier on hand to give your home that supplemental burst of fresh air in a variety of situations. The bottom line is this: being proactive about the air you and your family breathe goes a long way toward providing greater respiratory wellness. 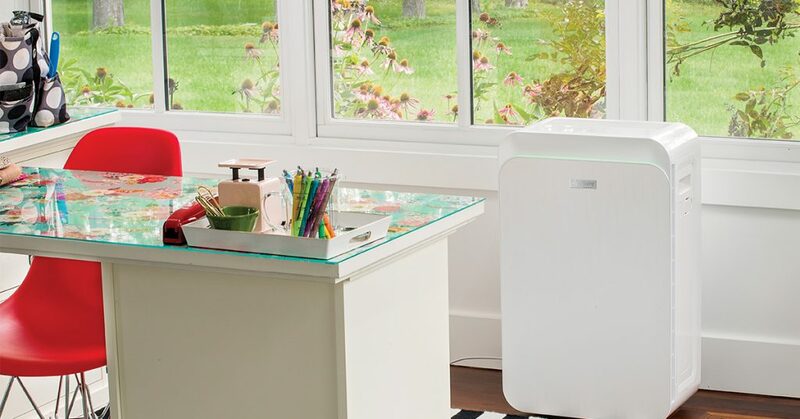 Clear the air, pure and simple, by removing indoor air pollutants and breathe easy. Find an Aprilaire professional to discuss whole home air purification today, or shop Aprilaire room air purifiers to supplement the purification in your home. Next Next post: Could Spring Cleaning Make Your Home Less Healthy?